Those creatures are Matagots, spirit familiars that resemble cats. Those cat-like creatures are Matagots, as Newt says when he sees them in the French Ministry. At that moment, MELUSINE enters the records room surrounded by growling Matagots. (scared) What kind of cats are those? Before Fantastic Beasts: The Crimes of Grindelwald was even released their name was already confirmed by the merchandising for the movie and on various websites. 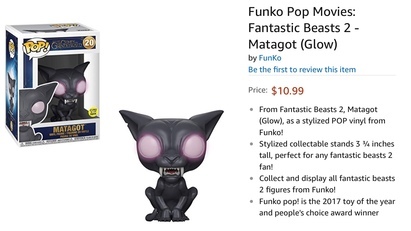 The officially licensed merchandise sold depicting the creature has it listed as a Matagot, and it’s recognizably the same creature shown in the picture. IMDB learned its name during a visit to the set of the movie, where they learned further information about it as well, like that they work in the French version of the Ministry of Magic. But in the upcoming movie, we enter the world of the Ministry for Magic Affairs of France (Le Ministère des Affaires Magiques de la France). One of the more impressive sets we visited, it is set beneath the streets of Paris but with a magical glass roof. Around these offices patrol feline Matagots, which resemble a hairless Sphinx cat. They mainly do menial jobs, including staffing the mailroom and providing security for various other departments. But, if provoked, they will transform into something far more menacing. The Leaky Cauldron, another website, confirmed the creature’s name during their set visit as well. With multiple sources confirming it, this creature shown in the trailer is a Matagot. Just to add some interesting bits - Matagots exist outside the HP world as well. The Wikipedia refers to them being in traditions of southern France. The word matagot is derived from the Spanish mata-gothos, from matar (to kill) and gothos (Goths). The Germanic Goth tribes settled in Spain, Southern France and Italy and eventually converted to Christianity, so Goth means "Christian" in opposition with Moro which means "Muslim". Hence a matagot would be an evil spirit who kills Christians. Another form is magot, and this word designs a bunch of money, a treasure, so the people who became rich were supposed to have a "magot" in their home. They have also appeared in other novels and works. Not the answer you're looking for? Browse other questions tagged harry-potter character-identification magical-creatures fantastic-beasts the-crimes-of-grindelwald or ask your own question. How can it be that wizards Apparate into Hogwarts in the trailer to Fantastic Beasts: The Crimes Of Grindelwald? Do Snape and Narcissa have scars from the Unbreakable Vow? How could Kowalski remember what happened in New York? And is the movie explanation?